When I heard that the first fashion magazine for big ladies in Japan would be published I was very excited. It smelled like revolution. Wasn’t this a sign for a change? For an end to magazines only displaying super thin models and a call for fashion designers to offer clothes in bigger sizes? How disappointed was I when the magazine appeared in stores at the end of March. I got me a copy in a bookfirst in Kobe where it was positioned right below the special issue of a magazine calling to “Loose weight beautifully!” with “easy exercises with which you will never gain weight again”. It was like a punch in the face of comedian Watanabe Naomi who posed on the first cover of la farfa. Anyways, I got the magazine and read through it, but there wasn’t actually much to read. It mainly introduces examples for how to combine clothes in a slimming way and the only texts were an interview with Watanabe Naomi and comments from a (thin) stylist on street styles of big girls. One thing that got clear in the street style section was that the Japanese Ms Chubby isn’t necessarily fat. She could be taller than average, have broader shoulders or a bigger bust to count as big. There are some girls in the magazine who really don’t look fat in any way for Western eyes. But because not everything about them is tiny, they fall into the “big” category. But all these girls complained about the same thing: That they aren’t able to wear clothes they like, because shops don’t offer big sizes. In fact, many brands only offer S, M and L so there isn’t much room for bodies not fitting this standard. Thus, introducing brands which do offer big sizes is probably the biggest benefit of la farfa. Thanks for posting this article! 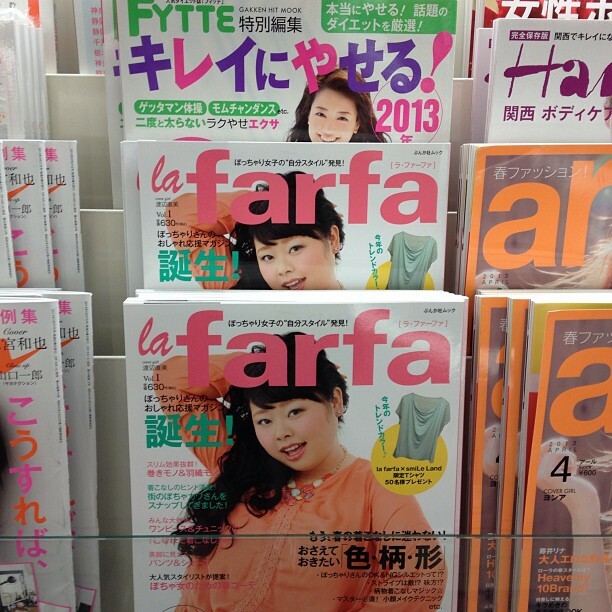 I haven’t seen la farfa in any stores in Okinawa, but I’ll start looking for magazines like it. And you’re so right–anything outside of S, M, and L is considered big here in Japan. Everything has to be one size fits all, and it’s annoying. At least in Okinawa, there are military bases, so stores like San-A and JUSCO have no choice but to carry XL and up sizes. Thanks for your comment! You’re right, there are some stores which offer bigger sizes, but usually not the ones promoted in fashion magazines. Please let me know if you find la farfa or similar magazines in Okinawa. I would be surprised if it wasn’t sold there. Or is the market very different from other prefectures in general?